A psychological superhero origins story, Unbreakable offers interesting nuggets without quite properly meshing. In Philadelphia of 1961, Elijah Price is born with a rare disease that causes extremely fragile bones. In the present day, security guard David Dunn (Bruce Willis) is the only survivor - and escapes without as much as a bruise - when a major commuter train derailment kills the other 131 passengers. David's soulless marriage to Audrey (Robin Wright) is just about over, with their son Joseph suffering the consequences but still idolizing his father. 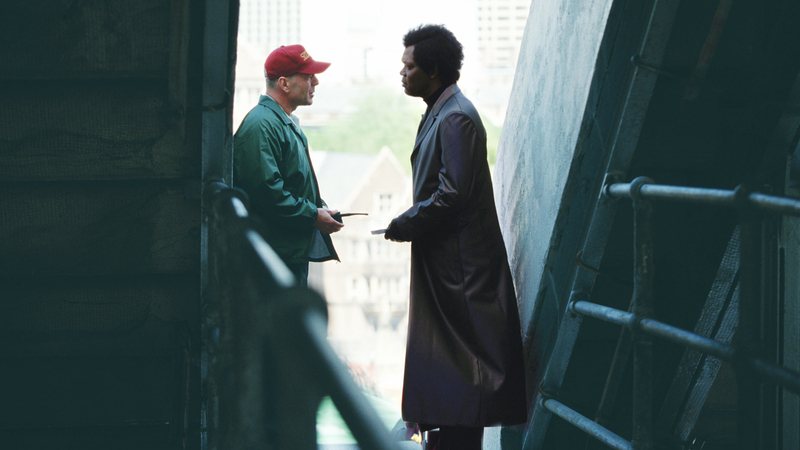 In the aftermath of the train derailment David is contacted by Elijah (Samuel L. Jackson), who now runs a comic art gallery. At Elijah's often irritating prompting, David realizes that he has never been sick in his life. With Joseph's help David tests his physical strength and is astounded at the huge weights he can lift. Audrey initiates a last-ditch attempt to save the marriage, while David still has to come to terms with injuries he sustained in a long-ago car crash that ended his promising football playing career, as well as his dislike of water. After the remarkable success of The Sixth Sense the pressure was on writer and producer M. Night Shyamalan to create a worthy follow-up. Teaming again with Bruce Willis, Shyamalan was only partially successful. 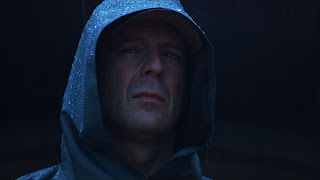 Unbreakable enjoys a dark moodiness as it delves into the psyche of a man who may be capable of a lot more than he knows. But a superhero origins story for an unknown superhero only goes so far, and there are enough plot holes to undermine some of the good work before the rushed ending arrives. The premise of a man getting to middle age having never noticed that he may be a bit special is difficult to swallow, and raises questions about just how smart this superhero is going to be. But beyond that, the awakening of an initially disinterested and disbelieving David Dunn to his own powers is at the heart of the film, and in another understated performance, Willis plays along. Walking away unscathed as the only survivor from a train wreck that claims 131 lives is a wake up call for anyone, and Dave, depressed as he is in a dead end job, listens enough to Elijah's haranguing to start exploring the art of the fantastically possible. The dynamics between David and his wife Audrey and son Joseph add another layer of depth to the film. Robin Wright deserves credit for soaking Audrey with grief stemming from a detached husband and a crumbling relationship, but still willing to put in the work to try and save her marriage. The father-son interactions are also intricate, Joseph demonstrating quiet resilience and carving a role for himself in his dad's transformation. But the scenes with Elijah generally don't work as well, his story limited to a few interventions and an ending that spirals to places Shyamalan does not give himself time to follow. Overall, the film's climax is an unsatisfactory muddle, and as David comes to terms with his powers, both the protagonist and the film become less interesting. Not surprisingly, unbreakable and unaware makes for better drama than just unbreakable.